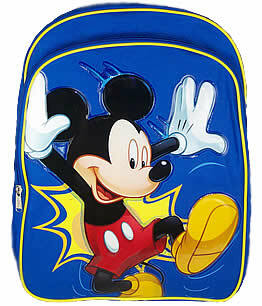 Full size material (canvas feel) backpack with raised plastic Mickey Mouse design on the front. Zipper closure. Adjustable straps. Mesh pocket on one side. Velcro close pocket on the other side. Zipper compartment on the front. Approximately: 11.75" wide x 15.5" tall x 4.75" deep, plus additional 1" depth for the front compartment.